Whew! I've been looking everywhere for you! Miss Kamila is in trouble, and I need your assistance again!! I need to swap a card I found with something else in order to protect her, but they have to be the same color. The bad thing is... I can't see color because I'm a Pomeranian! This card thought it could hide in a place full of light boxes! I thought I might get in trouble because there were so many people shopping for big and little light boxes, but I got the card without being dognapped! On my way out, I met another dog! He was very friendly, but a little strange. He claimed to have been to space! This game will end a week from today, August 3rd! There you are!! I'm so glad I found you! Miss Kamila is in trouble, and I need your help! I have to swap a card I find with something else of the same color to help her! The bad thing is... I can't see color because I'm a Pomeranian! It was hard to find another card to bring to you! Someone must be cleaning them up because I searched everywhere and couldn't find one! I had to go across some water to find this one! It was sitting outside of a place by a funny statue in the front! The statue was very tall, and a lot of people were looking at it! While they were looking, I ran under the rope and got this card! Can you tell me the color of this card so I can save Miss Kamila? I promise I will sniff out two cards and bring them back to you! This game is now closed! The correct answer was gray! I'm glad I found you again because I really need your help! Miss Kamila is in trouble, and it is my duty to save her! I need to swap a card I find with something else of the same color to help her! The bad thing is... I can't see color because I'm a Pomeranian! That is why I need your help too! Looking for a card today was hard! It was very rainy outside, and I had to stand a lot under door umbrellas so I wouldn't get wet!! That's what I was doing when I spotted this card lying out in the rain by a puddle! A lot of cards sure do get into trouble! I have to save them and Miss Kamila too! Can you tell me the color of this card? I promise I'll sniff two cards out and bring them back to you! This game is now closed! The correct answer was purple! I know it took me so long to get here, but there's a good reason!! I was looking for another card for you so I can help my mistress, Miss Kamila! You see, I really need to swap a card with something of the same color, but the bad thing is... I can't see color because I'm a Pomeranian! That's why I need your help! I looked up and down for a good card, but I couldn't find one anywhere! I finally found this one, but it was lying in the trash in an alley! I don't know who threw it out, but I couldn't let it go to waste!! It can help us save Miss Kamila! So can you tell me what color this card is? I'll swap it with something of the same color, and then I'll sniff two cards out to bring back to you for your help! This game is now closed! The correct answer was red! Tricky, tricky! Hey! I am glad I found you again! Miss Kamila and I need your help! You see, Miss Kamila is safe, but she is also in trouble!! She was going to a party with friends from across the big lake! They are celebrating a day of End-y Penance! I'm not sure what penance is, but it must be the end of it! Miss Kamila was going to take them a gift: one card for each color of their flag! She has a white and a red one, but she lost the last one, the blue one!! I want to help her find a blue card, but the bad thing is... I can't see color because I'm a Pomeranian! So I need your help! I brought you some cards--can you tell me which one is the blue one? I can't read names, but I do know directions! Please tell me if the blue card is on the left, the right, or in the middle! Afterward, I'll know what picture to look for when I search for one that my teeth haven't ripped! You'll have to help me carry it to Miss Kamila though... if you don't mind! If you help me and Miss Kamila, I'll sniff out two cards and bring them back to you! This game is now closed! The correct answer was the one on the right! P.S. Happy Canada Day too on the 1st! I'm so glad I ran into you again! I need your help!! Miss Kamila is in trouble, and it's up to me to save her because she's my mistress!! I have to swap a card with something of the same color, but the bad thing is... I can't see color because I'm a Pomeranian! I found this card outside of a strange store!! Some people going in were dressed oddly, and some people coming out were dressed oddly too! There were lots of string, and belts, and buttons.... I'm not sure how the people going in didn't die because they kept calling it "hot"! Maybe the cool air blower was broken!! Can you tell me the color of this card? I won't let your hard work go to waste! I'll sniff out two cards and bring them back to you! This game is now closed! The correct answer was green! I'm so glad I found you! I need your help again! Miss Kamila is in trouble, and I need to swap a card with something of the same color to save her!! The bad thing is... I can't see color because I'm a Pomeranian!! I need you to tell me the color of the card I show you! Finding this card was strange! I was walking by the woods and saw a fox trying to tear this card up! I rushed as fast as I could while barking!! I think I scared the fox because it suddenly ran away into the woods! But it was too late.... The card had already been torn up! It should still work though! All I need to know is the color of this card! Can you tell me? I promise I won't let your hard work go to waste! I will sniff out two cards and bring them back to you!! This game is now closed! The correct answer was yellow! I spared you from the terrible Hughes card... this time. I found you again! Maybe you can help me, and then I can save Miss Kamila! She's my mistress. I need to swap a card with something to keep Miss Kamila out of danger, but they need to be the same color! The bad thing is.... I can't see color because I'm a Pomeranian! Can you tell me the color of this card so that I can help Miss Kamila? I promise your hard work won't go unnoticed! I will sniff out two cards and bring them back to you! This game is now closed! The correct answer was orange! 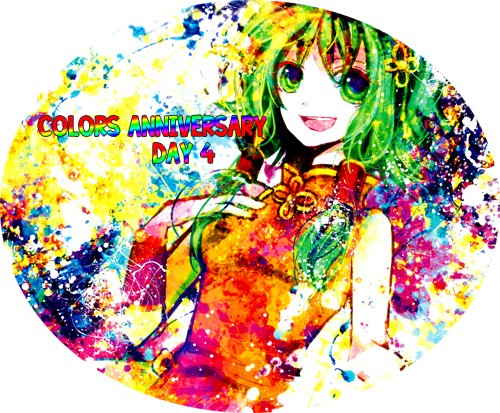 Happy Colors Anniversary, players! Have you ever wanted people to tell you their favorite books, or movies, or television shows, but all they give you is a list of names or titles, and you have no idea if you'll like them? Mama usually associates polar bears with Coca-Cola no thanks to expertly devilish marketing, but she has recently found a show (and also a manga!) with a polar bear that, instead of coercing you into drinking carbonated beverages, is trying to coerce you into consuming scrumptious organic food! To be honest, he runs his own cafe, and Mama can appreciate that! But Mama thinks it's beginning to get unbearable having to watch such delicious food without making some herself. So she did! She made some ... ah, what is that? Mama says they make good appetizers, and they have a lot of different names! Ground meat and vegetables are usually stuffed inside thin dough, and then the edges are given their traditional "crimp." Sometimes they are boiled in water, but typically they are fried on one side before being steamed with water. They are almost always served with some kind of dipping sauce! So do you the name of the food Mama has made? She's counting on you to know it, and if you do, she'll be glad to give you two cards for dessert! This game will end two weeks from today, June 16th! I got here as fast as I could!! Miss Kamila is in trouble, and I need your help! I have to swap a card I find with something else of the same color to help her! The bad thing is... I can't see color because I'm a Pomeranian! I need your help twice this time!! You see, I found a card, but it's out of my reach! I tried jumping for it, but I always missed! I tried to get others to help me by barking, but I don't think they could understand what I was asking! There's a card stuck to a tree over there, and I promise I'm not playing a joke on you! I need you to help me get it down so I can swap it!! Do you see it? I'm not sure how that card got pinned to the tree by an arrow, but if you could please get it down and tell me its color, I would be grateful! I won't let your hard work be forgotten! I will sniff out two cards for you and bring them back! This game is now closed! The correct answer was red! I am sorry I am late!! I had a hard time getting this card because it was stuck in a big outside bathtub! It was always floating in the middle just out of reach! I tried very hard to get it, but spent most of my time barking angrily!! Finally, I was able to paw it close enough to grab it with my mouth... which is why the bottom is kind of torn!! It was very soggy! I don't why someone would drop a card into a big outside bathtub, but I saved it! Maybe it will still swap with something of the same color even if it is wet, so I need your help! Can you tell me the color of this card so I can help Miss Kamila? I promise I'll reward you for your help! I'll sniff out two cards and bring them back to you! This game is now closed! The correct answer was blue! Mama thinks she really shouldn't be into watching superheroes! A friend got her to watch some of Samurai Flamenco, and she has only stopped marathoning it in order to cook something she saw in one of the earlier episodes! There's nothing like deep-fried pork and some shredded cabbage! Mama even made up a type a thick Worcestershire sauce to drizzle over the top of it! She also has some tsukemono--"pickled things"!--on the side, and some ponzu in case you want to pass on the Worcestershire sauce! Okay, okay, Mama will cut to the chase: Can you tell her what the name of the pork dish is? She'll reward you for your hard work--a few episodes of Samurai Flamenco, some food, and two cards for dessert! This game will end two weeks from today, June 2nd! 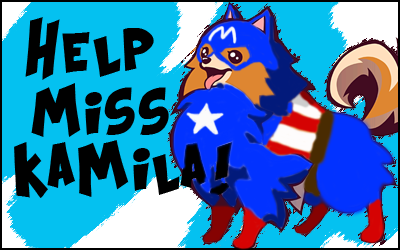 I came as fast as I could with a card so that I can save Miss Kamila, but I still need all of your help! I have to swap this card with something else of the same color, but the bad thing is... I can't see color because I'm a Pomeranian!! That's why I need your help! I looked all around for a card and couldn't find any! I had almost given up, but then I saw this card sticking out of a basket beside of an old lady in the park! She was twirling two sticks together so that the string from the basket turned into a long piece of cloth!! It was magic! She said she was making a "scarf"! Can you tell me the color of this card so I can help Miss Kamila? I promise I will reward you for your hard work!! I will sniff out two cards for you and bring them back! This game is now over (and I just noticed my wrong date)! The correct answer was brown! How tricky! There you are!! I really need your help, and I need it fast! Miss Kamila is in trouble, but I need to help her get out of trouble before tomorrow gets here! You see, Miss Kamila is just my mistress, but she is also like a mother! I don't remember my real mother, but I know she would be very proud of Miss Kamila, so that is why I must try my best to save her before Mother's Day! The only problem is... I can't see color because I'm a Pomeranian! I need your help to swap a card with something else of the same color! I was looking all around for cards to bring you, and I found this one outside of a flower shop! A lot of people were there!! They must be buying flowers for Mother's Day! I also found something else! There was a strange round thing beside the card, and it kept making a ticking sound, so I kept pawing it until it opened!! It was a tiny clock! I think there is some writing on the inside, and I'd like it if you could tell me what it says!! Maybe it has the name of the person it belongs to, and I could take it back to them!! Do you know the color of this card? And do you know what the tiny clock has written on the inside? I promise I will not let your hard work go unnoticed!! I will sniff you out two cards, and then a third one for the tiny clock!! This game is now closed! The correct answers were green and red and either "Don't forget, 3. Oct. 10" or "Don't forget, 3. Oct. 11"! This is strange! 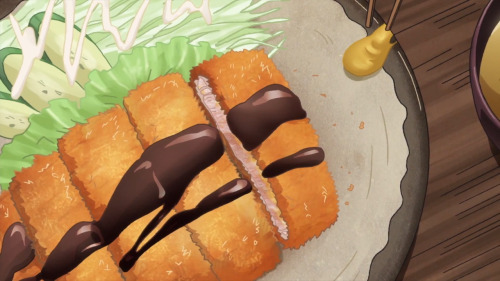 Mama has been watching an anime that has a lot to do with penguins, but apparently also a lot to do with food! 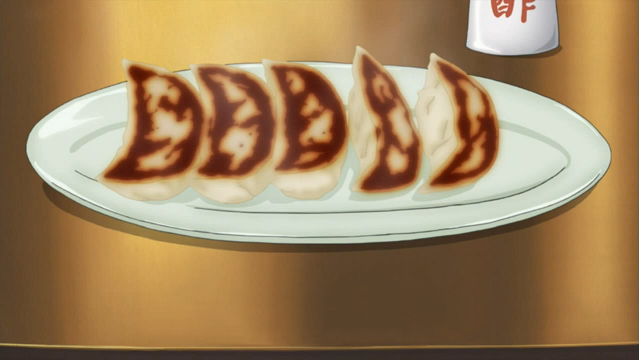 She's only two episodes in, and she's already seen enough food to get her mouth watering! 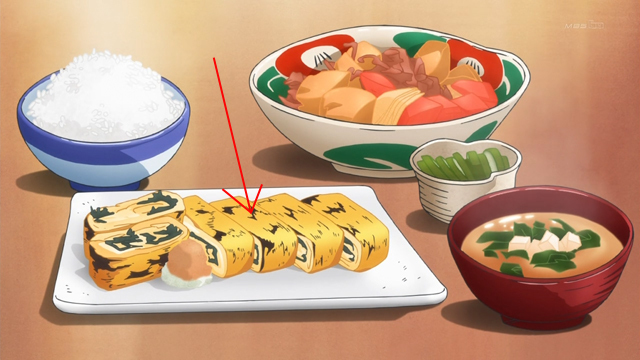 So she has decided to make tamagoyaki, or a type of Japanese omelette that is created by rolling many layers of egg together! Other things can be added: spinach, sake, seaweed, or a puree of shrimp! Most of the time, it is cut into little squares like these, and it is served with a whole bunch of different things, especially sushi! But before you can even have a sniff of it, Mama wants to know if you can tell her the name of the show she was watching! If you guess correctly, she'll give you two cards for dessert! This game will end two weeks from now, May 19th! I was wondering around in town to look for some cards, and I spotted this one outside of a strange store that sold small boxes and shiny frisbees that you put into larger boxes!! Then some things come up on a big, big box, or sometimes a small, small box they can carry around with them! A lot of people were getting them, so they must be fun! It reminded me of the thing Miss Kamila uses to listen to music!! Do you know the color of this card? I'd really like to know so I can swap it with something of the same color and help Miss Kamila! I promise I will pay you back for your hard work! I will sniff out two cards for you!! Hey! Hey, you're in Miss Kamila's house! That's my house, too! WELCOME! I'm so glad you came! Miss Kamila is in big trouble again, and it's up to me to save her!! I need to swap a card with something of the same color, but the bad thing is... I can't see color because I'm a pomeranian! Now that you're here, you can help me out! I already have a card for you!! I found it in the kitchen! It fell off the counter and surprised me, but it smells so good that I just couldn't be scared! Mmm! Mama has been eyeballing this crusty, cheesy, delicious pie dish! It looks like quiche to her, and she's going to make two of them--a vegetarian one, plus one with beef! Quiche can be eaten hot or cold, but Mama prefers hot quiche! It's made with milk or cream and eggs, and this becomes a custard when baked. Cheese and either vegetables or meat is then added! 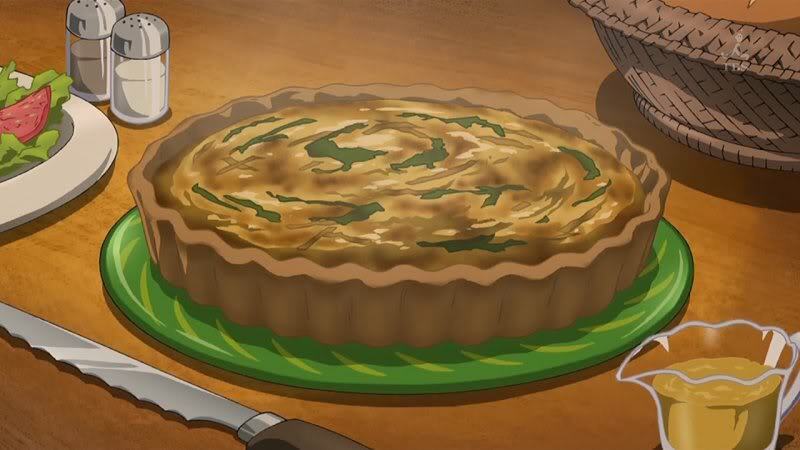 If you've never tried any, Mama says quiche is actually quiet tasty! She can eat it alone or as a side dish with something else! But now here comes the big question: What show was Mama watching when she got her inspiration? Tell her, and she says she'll give you a slice of quiche and two cards for dessert! This game is now closed! The correct answer was Fullmetal Alchemist: Brotherhood, but Mama will also take just Fullmetal Alchemist! I finally found you in all of these people!! Miss Kamila is in trouble, and I need your assistance again!! I need to swap a card I found with something else in order to protect her, but they have to be the same color. The bad thing is... I can't see color because I'm a Pomeranian! There were a lot of people going into a pointy building, so I followed them! We don't have very many pointy buildings like this here. That's definitely something to investigate--a lot of people going into a strange place! This card was sitting on the steps outside! But then loud bells began to ring, and I had to run out of there! I couldn't even hear myself bark over them!! I never got to see exactly why so many people were going into a pointy building, but my duty to help Miss Kamila comes first! Will you tell me the color of this card so I can help Miss Kamila? I promise I will repay you! I will sniff out two cards just for you!! This game will end a week from today, April 27th, but of course, another one will hopefully go up on Saturday, April 26th! Happy Easter for those that celebrate it!